1 Ball Mighty Stitch Bulky in "Blush"
1 Ball Mighty Stitch Bulky in "Serrano"
1 Skein Luminance (100% silk!!!) in "Brilliance"
1 Ball Wool of the Andes in "Red"
1 Ball Wool of the Andes in "Coal"
One winner will receive one prize pack. No purchase necessary to enter. Void where prohibited. Open worldwide to entrants 18 and over. Enter to win using the Rafflecopter below (sometimes it takes a moment to load) Now go, go, go, and enter! Special thanks to Knit Picks for sponsoring this giveaway! Happy Anniversary and thank you for the giveaway. I'd like to try felting with the WOTA yarn and perhaps a cowl or hat with the bulky (not sure yet). I'm just learning to knit and the needle set would be awesome. Awesome give away!!! Purple is my favorite color!!! Happy birthday! I think GIVING gifts on your birthday is an excellent way to celebrate! Awesome giveaway! Love following you and seeing your creations! I love the prize pack. I've been dreaming of buying an interchangeable set from Knit Picks, but winning some would be even better. Dear Jennifer, first off, I like to thank you for all your tutorials I appreciate your patience and time of how professional on how you explain each lessons. I've learned so much. Blessings to you always. Happy anniversary! Thanks for the giveaway! This would be a dream!! I love your videos! Excited about the giveaway! Happy Anniversary. I love your youtube channel and always await you new videos! Thank you so much for the inspiration! Happy Birthday fiber flex. Great job all these six year. Your yarns look great to use along with your crotchet hooks & knitting needle, which I never use before. It all sounds great to have & use. Love this yarn and since I don't buy supplies during Lent, it sure would be nice to have. The quick cowl pattern is great, too. I would crochet something that is fun,,,I was thinking maybe about making some little girl hats , or possibly some baby slippers. Happy 6th Birthday Fiber Flux!! I love and follow all your social media! Time flys i remember following your blog at the a few months after it started, when i was learning to crochet and its thanks to you and all other youtubers that now im a confident crocheter! Planning on making some crochet baby items- lots of friends having babies! Ready to try out this yarn for the first time! I would love to make a scarf for my sister with the Luminance, and maybe a cute hat with the bulky! Happy birthday!!! I see a beautiful cowl and shawl in my future if I am lucky enough to win!!! Thanks for the chance. Happy Birthday Fiber Flux! Nice giveaway, hope to win! 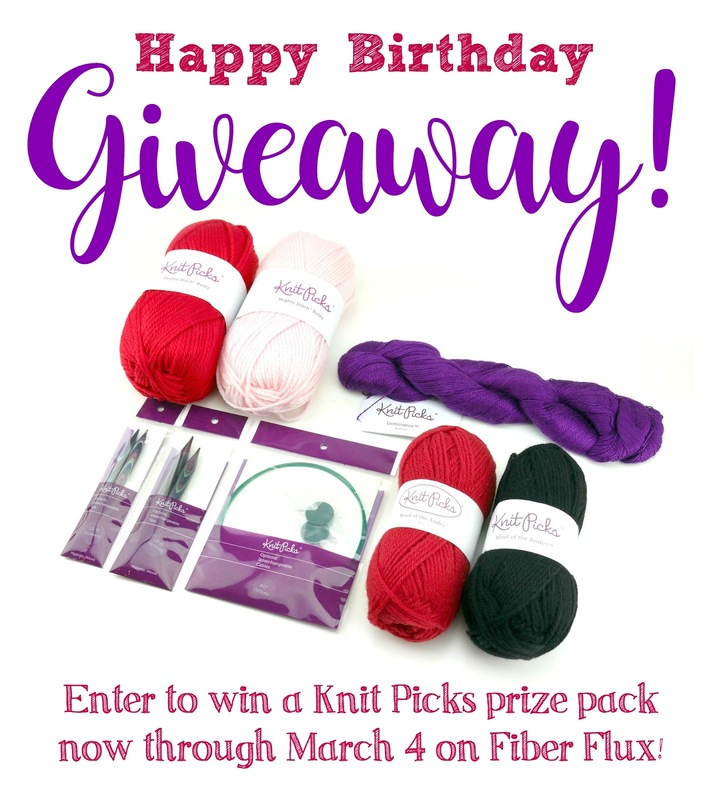 Happy Birthday Fiber Flux! Nice giveaway!! Hope to win! Would love to win this give way and make my fist Tunesian shawl with it! HAPPY 6th ANNIVERSARY!!! Today is also my son's first birthday!! Happy anniversary!! I would love to make a cowl with this yarn. Happy anniversary! Thank you for all the wonderful designs and patterns you have given us crafters over the year. They are definitely enjoyed by everyone . Keep doing what you're doing. Happy Birthday! Thank you for a great give away! I'm not sure what I'd stich up, but the luminence would make a great spring scarf. I love watching your youtube channel ..very useful for learning new things for the beginner like me. Happy Birthday!!! I've been following Fiber Flux on YouTube for quite a while now, and I absolutely LOVE IT!! Have tried or done most of the projects and always excited when new ones pop up! Happy Birthday!!!! Great giveaway! Would love to win.. could try felting for the first time!! I'm always knitting hats, so would definitely knit some hats.. maybe a cowl with the bulky it would knit up fast. Happy Birthday!!!!! Great giveaway! I would try felting. I'm always making hats so definitely would make some hats! Bulky would do a cowl knowing would knit up fast. Happy Birthday! Thank you for the giveaway! I'd like to try felting, make a hat and some socks. I'm just learning to knit and would love to get these things. Love your YouTube channel. Happy Birthday! Thank you for the generous giveaway!! I am new to knitting and would love to knit a shawl with the silk yarn. Thanks for the giveaway. I'd try a hat with the bulky, some mittens with the wool and maybe a spring/summer scarf/cowl with the silk. Love the colors! I love your awesome projects and easy to follow tutorials. Thank you so much! It's my 60th birthday today as well. Birthday twins. Would love this prize. Thank you. A nice pair of winter mittens, hat and a few pairs of childrens mittens. Beautiful prizes in the giveaway. I don't knit, I crochet but if I win I will give the beautiful knitting needles to my 83 yr old neighbor who does knit. Thanks for doing the giveaway. Thanks for the giveaway. I'm a crocheter, but learning to knit is on my to do list. I'll probably crochet a cowl or a scarf. i love your blog! I really want to learn the shell stitching for a triangular scarf! Happy Anniversary, Fiber Flux! I love your channel. I started knitting last June and love it. The bulky yarn would be great as a scarf or hat and I'm not sure about the other. Thanks for all you do for us needlers!!! I love your videos!! As a novice crocheter, I learned a lot from your videos!! Thank you! I dont know yet the possibilites are endless, I LOVE knit picks!! I am not sure what I would stitch with it - the possibility of winning is too exciting to think straight! LOL! One of your cool cowl pattern most likely! What a lovely giveaway! Thanks for the opportunity! I am not sure what I'd make but maybe my first colorwork hat! Happy Birthday Fiber Flux! I love your blog and YouTube channe. I have made a few of your crochet patterns. They are all lovely. I'm extremely new to knitting, (one week now) and think those needles are gorgeous. Keep up the great work and beautiful patterns. Thanks for the opportunity to take a chance on winning this fabulous prize pack. I am not yet certain what I would make with the yarn but I am sure I would find inspiration from actually seeing and feeling the yarns. I love your blog, because I always get inspired to start a new project. Happy Birthday! I love your blog, because I always get inspired to start a new project! Happy Birthday Fiber Flux! Happy Anniversary. I would give this to my friend Sandy and let her do her magic. She loves knitting and crocheting. I would like to stitch up some finger-less mitts,a hat. Thanks SOO much for This giveaway!! Hope I'll win! Happy birthday to your blog! Your post and videos have inspired me and given me the confidence to complete some of your projects as gifts to my family. As a birthday present to myself, I think the silk yarn, which is my favorite color, would work up into beautifully into lacy wrap. I've been thinking about trying a dragonfly or butterfly pattern. Wow thanks for the giveaway. Happy Happy Anniversary!!! I'd have to feel it to let it tell me what it wants to be. Maybe a cowl for my back leathercoat with part of it. Happy Birthday Fiber Flux! Love seeing your posts on Facebook! Would love to win Knit Picks prize! Congrats!!! I don't know how to knit very well yet, but I'm working on that. Happy Anniversary and what a generous giveaway...I would love to win these beautiful products. I could make something really gorgeous!!! Happy Birthday! Wonderful giveaway--those needles are stellar! Happy anniversary! I love knit picks yarns. I might use the bulky yarn in a blanket, of course I would have to buy more. :0) Not sure what I would make with the other yarn. Thanks for a chance to win your giveaway. Happy birthday, excitong giveaway. I have so many ideas what I cud make I think my head cud explode lol. Happy "Birthday/Anniversary" Fiber Flux. I so enjoy your YouTube channel and blog. Congratulations on your special day feel with excitement and new things to try each day that pass by...Happy Birthday Fiber flux i enjoy all your videos..
As I sit here singing HAPPY BIRTHDAY DEAR FIBER FLUX!, I can't help but think how your talent, humor, hard work and dedication have brought you much well deserved success. But it's just 100% pure good luck that you don't have to hear me singing. Happy Birthday and thank you for writing this blog. I love your patterns and try quite a lot of them! 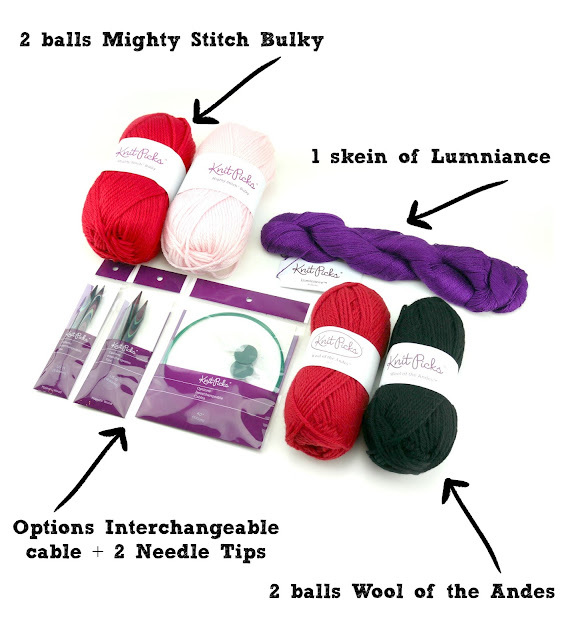 I have not been knitting the last few years, and, if I am fortunate to win these items, they will be a big push for me to get back into knitting. I am hoping I win! I'd probably knit a cowl or some gloves with the bulky yarn and I would use the lace yarn for a scarf with beads in it. Great giveaway! I am just learning to knit, so this will come in handy learning new skills. Thanks Fiber Flux!! Happy anniversary and thanks for the awesome give away. I love the purple yarn. Thank you for such a generous giveaway! Congratulations on your success! I think I would make a scarf and hat set. With the silk I would make a shawl! Happy 6th Anniversary. Love the yarns that Jennifer shows! I've been wanting to learn how to knit, but haven't tried it yet. I love crocheting and the videos that Jennifer shares. Happy anniversary, I hope you keep on making more content because I love your channel and how easy it is to follow along. I would probably make my kitty a blanket. Happy Birthday to Fiber Flux �� �� . These would make beautiful cowls and hats! Something soft and feminine with the Luminiance. Oh! I love it, not sure yet what project I would make for it...I'd have to find the perfect pattern for it! Good luck everyone! Happy Anniversary fiberflux.... Amazingly, i complete 3 years of crafting too this week... And love your vlogs... The yarn and colors i see everytime i get notified of your new vdos, inspire me too try new colors. Thanks u for those happy vlogs. Happy Anniversary! I love your work and would like to win the give away. I am just learning to knit, I've been crocheting for almost 50 years my grandmother taught me at the age of 10 with ribbon and we made rugs. Thank you for all of your instructional videos, you are great and I have learned quite a bit. I would make hats and cowls out of the beautiful yarn. Never dissapointed when watching you on youtube. I would love to try knitting a shawl with the Wool of the Andes. I'm still really new to knitting. Happy anniversary! Thanks for the great content and the cool giveaway! Would love to win and I don't have any knitting needles but know how to knit(beginner). Happy Birthday/Anniversary :-) I'm too new to knitting, so I don't feel comfortable doing anything wild, so scarves it is. Or, maybe putting some squares together for an afghan. Happy birthday! 🎂 If I won I'd put the silk with the other silk in my stash and make something beautiful and awesome for myself! This is a fantastic giveaway! I haven't tried bulk yarn yet and would love to. Thanks for the chance to win!!! Im excited for the giveaway; I was thinking to make maybe a beanie with the yarn. Im not professional neither but I hope I can learn more with the giveaway xD. Thank you for the yarn and needle give away. I am a crocheter but want to learn to knit. I would love to do a hat but will probably start with a scarf. Beautiful Give-a-way! Love the silk! Happy Birthday and many more! Happy birthday Jennifer.. Love your patterns and watch every YouTube video. I would make a shawl with the luminous silk and scarves out of the other yarn. Oh man, I'm dying to try those needles!!! I'm going to have a go at making a hot with circular needles- I haven't used them before- and challenge myself also by finding a new stitch to incorporate in the design. Happy Birthday!Love Knit Picks and Fiber Flux patterns! Happy anniversary! My goal is to learn to knit after I complete my son's Arcanine blanket and my Friends CAL blanket. What a fun giveaway! LOVE all your tutorials and You Tube videos! Thank you for the giveaway! Thank you so much for the give away!! I have a pair of Knit Picks needles and as you said they are smooth. Wow, what a great giveaway!I would use the purple silk for a shawlette for Spring wearing. Happy Birthday, Fiber Flux. I love your youtube channel. I learn so much and am already a better crocheter. I'm still learning how to knit. I've knit a few things over the years, but I'm still a newbie at it. I love the colors of the yarns and the circular knitting needs in your giveaway. I'd definitely put all those to good use. Happy Birthday, Fiber Flux. I would love to win the giveaway, and have several projects in mind for your exceptional yarns....e.g. a shawl, scarf, hat etc. Good luck to all the participants. A cowl would be nice. Happy 6th birthday Fiber Flux! Love your blog and videos! What a fun selection. Perhaps I would actually learn to knit with this package! Bonnets! I'm so into them lately!!! Happy Anniversary, love your patterns. I would use it to make a cowl or a hat! A shawlette with the silk, a hat or cowl with the bulky and mitts and a cowl with the wool. Thank you for the giveaway. I would probably make gifts for family and friends. Thank you for all yours tutorials. I love your Channel and i will be happy to win your price ! Thank your for this giveaway ! Thank you for yours tutorials ! I love your Channel and Thank your for this giveaway! I would like to make a shawl. I like the colors they will work together. I think I would knit a chunky cowl with the bulky yarn and not sure for the others yet. But the needles look awesome! Would love to win the giveaway.. Happy Birthday! 6 years is a long time to sustain a blog. I truly enjoy your content. Thank you for the fab giveaway! Cowl, mittens the possibilities are endless! I want to make my grandsons a pizza blanket. i think this would be a good start for that project. Not the wool or silk, but the blend yarn anyway. Your tutorials are always so clear and informative. I love watching! Keep the videos coming! Not sure what I will knit, but love the colors and love Knitpicks.